The Miniature Australian Shepherd—now known as the Miniature American Shepherd—originated rather recently, having come to existence in in the late 1960’s. Similar to Miniature dogs of different breeds, they originated when a breeding program opened up to consolidate and streamline smaller Australian Shepherds. Basically, they’d take the smallest purebred Australian Shepherds and then mate them with others akin to their size, producing a miniature variation of the breed that still holds all the merit of an Australian Shepherd, yet is just smaller. With a quick rise to popularity, these dogs really came to the light at the end of the 20th century, when multiple breeding programs began to produce quality puppies. They were (and still are) used to herd smaller livestock. They still have all the ‘herding dog’ in them, and the same striking intelligence, the difference is they’re smaller, meaning they’re even more apt to come home after a days’ work and be the perfect household pet. Equestrians became particularly keen to the dog since it was small enough to live at home, easy to travel with, and intelligent enough to be an asset on the ranch. However, over time, since the Miniature Australian Shepherd established itself as a versatile, loving, and nearly perfect breed for ranchers and farmers, the name changed from Australian to American. Know that these two are mutually exclusive, and remain to be the same dog. The AKC recognized the breed in 2015. 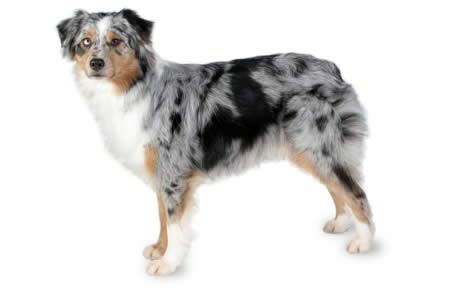 Being that the origin of the Miniature Australian Shepherd comes from a herding dog, they exhibit the quintessential traits of the respective archetype. These dominant and confident little canines are intelligent enough to herd (which makes them highly trainable and docile) but they’re not without their own sense of independence. This means that they’ll challenge their owner at every turn (if given the opportunity) and that they need firm and consistent leadership or their need for stimulation will steer them towards mischief. Naturally aloof and a bit standoffishness to strangers, these dogs are dignified and comfortable taking the lead in situations. They’re not the all-around friendly dog that wants to greet and love everyone, rather they hold themselves with an air of reserved caution, and only open up once the person has earned their trust. Like with most herding dogs, they’re incredibly loyal, and can often be one-person dogs if they’re not raised with a family. But all-in-all what you’re getting from a Miniature Australian Shepherd is just an Australian Shepherd in a smaller form. They’re highly trainable, intelligent, loving and loyal to those within the home, and aloof towards other canines and strangers, although hardly ever aggressive. They are through and through a herding dog. Training a Miniature Australian Shepherd is a dynamic, exciting, and necessary process. These little dogs crave stimulation, and it’s often satisfied when they’re trained. The original breeding program did not produce these pups to be ‘pets,’ more so they wanted a versatile working dog that could fit better within most homes. At the very least, puppy classes are a must (especially because Mini Australian Shepherds have a propensity to nip, yap, and chase—spurred by their herding drive). Often those who own Miniature Australian Shepherds do so because they want them on the ranch, or to herd their droves, and thus they go through extensive training to learn how to be a landrace animal, and a utility on the farm. Thing is, they adore the training. If you’re buying a Miniature Australian Shepherd simply to have as a pet—there is nothing wrong with that—but be sure they go to obedience classes so they can have that same stimulation they’d receive otherwise. Naturally docile, the lessons will sink in and they’ll know to bring them home. Within the home, the owner should establish themselves as the alpha (immediately) and hold a firm but not aggressive hand. This breed will challenge their owner at any given opportunity, and they naturally seek leadership (all the while they’re not really that sensitive, meaning they want someone to take the lead, or they’ll take it themselves, in which case it’s important to iron out what’s wrong and right from the get-go. A positive reward system should be used when they exhibit good behavior. Then, early socialization is the key to a better temperament in adulthood. Don’t expect your Miniature Australian Shepherd to be the center of attention or to want to play with all your friends/other dogs (although this very well could be the case), but if you expose them to other dogs, people, and social environments early on there’s a better chance they’ll be more of a socialite. Despite their smaller size, the MAS needs around 30-45 minutes of exercise per day, and more if you’re living in an apartment. They benefit from having a yard to run around in, and will love to accompany you on anything you do. If that’s a walk to the store, down the street, or on a bike ride to the beach, the MAS is completely content being at your side (and they have serious stamina, too). With such an intense energy and need to exercise, if their needs aren’t met, they can turn destructive within the home and grow both tireless and anxious. Exercise is a perfect time to incorporate training, too. Play games and teach them tricks to stimulate both their intellects and bodies, and you’ll have a satisfied Miniature Australian Shepherd that just wants to jump into your arms at night and cuddle you to sleep. The Miniature Australian Shepherd typically lives anywhere from 13-15 years. Are Miniature Australian Shepherds a popular breed? The Miniature Australian Shepherd (now referred to as the Miniature American Shepherd, being that it was developed here in the states) ranks 36th on the AKC’s most popular list of 155 dog breeds. They’re fantastic pets for owners who have the time to devote to them (for training and exercise), have a natural enthusiasm that makes them wonderful adventure buddies, and are both loyal and loving within the household. Since the 1960’s they’ve only gained popularity, and since they do well with children (if they’re socialized with them at a young age) they make a great pet for the family, and are small enough to adapt to most living situations. The MAS needs around 1-2 cups of high-quality dry food per day, broken into two even meals. Often, owners will underfeed this breed due to their size, when in actuality they need a bit more sustenance due to their incredibly high activity level. Diet isn’t really a problem with this breed, as they’re built for longevity and aren’t fickle about their food choices. Despite, age, weight, metabolism are also integral factors to consider when administering a balanced diet to your MAS. No two dogs are going to eat the same, and it’s important that the owner monitors their diet and ensures they’re receiving the proper nutrients, and that they’re not gaining excessive weight (although obesity isn’t really a worry with this breed). The MAS sports a mid-length double coat that’s highly weather resistant. Their coat is dense enough to protect them during winter (it’s also quite water resistant) and then sheds in the spring to lose its weight before the summer heat comes along. The hair is usually some variety or blend of flat and straight, or slightly wavy, with smoother skin around their faces and at the bottom of their legs. These dogs certainly shed, and will need to be maintained to mitigate this issue. Do note, they shed the most at the end of winter, making them seasonal shedders, and will often need extra care at the end of the year. A weekly brushing should suffice, with double or triple that when the season calls for it. Use a dilution solution before brushing these canines, as their long hair can often tangle, and if it’s not treated beforehand then brushing can be a painful experience for them. These beautiful coats (which come in colors form autumn red, blue merle, tri-colored (skin, whitish, and black)) truly give the MAS character. However, they need consistent brushing, but not bathing (although this is completely dependent on how often your dog is outside and rolling around in muck). Bathe them as needed, and use a product that won’t deter the coat of its natural oils. In terms of hygiene, brush their teeth 2-3 times a week to avoid tartar and bacteria build ups. Trim their nails monthly, but often you won’t have to as their rigorous activity will wear them down naturally. Examine every facet of their body for anything suspicious (inflammation, redness, parasites, infection, etc.). Take them to the vet for a yearly checkup, but generally this is an incredibly healthy breed. Are Miniature Australian Shepherds good with children? The MAS is a herding dog, meaning if untrained, they’ll try and ‘herd’ children. What this means in the dog world: they’ll chase the kids around, try and herd them, and this might cause them to nip or bark at them. Now, this doesn’t mean they’re poor with children, just that their natural herding drive can make them a nuisance if not properly trained. If a Miniature Australian Shepherd is introduced to children at a young age, and both parties are taught how to properly interact with one another, they make fantastic companions, lovers, and protectors of the young ones (and they love to play!). A MAS not properly introduced or trained around children needs to be supervised closely if they’re around little ones. Hip Dysplasia: a condition that is quite common amongst highly active breeds, it occurs when there’s displacement between the femur and the hip joint. It causes severe pain when walking, an abnormal gait, lameness in the leg(s), and at worst immobility. It’s important to note that it can be screened for, only stressing the importance on receiving health clearances for the parents. There are treatments available for this condition and surgery if it’s bad enough. But generally, the dog will live a perfectly healthy life and often change their gait to adjust to the bad hip. Osteochondrosis Dissecans (OCD): this condition occurs when the joints develop abnormally (most common in the elbow) and the cartilage doesn’t form correctly. It’s usually a condition that occurs early on in the dog’s life, and is sometimes linked to an overfeeding of growth formula. What it does, is it stiffens the joints, reducing mobility. It ranges in severity and there are multiple treatments available for the condition. Progressive Retinal Atrophy (PRA): a common eye disease in dogs, this condition occurs when the photoreceptors in the back of the eye begin to fail. At first night blindness ensues, which eventually progresses into difficulty seeing during daylight, and unfortunately evolves into complete blindness. The one silver lining is it can be diagnosed well before the dog has gone blind, allotting a fair amount of time for both the owner and canine to prepare for the future. Juvenile Cataracts: the condition occurs when there’s an opacity on the lens of the eye (eye-related health issues are the most common type in Miniature Australian Shepherds). It causes a gradual loss of eyesight, which can result in complete blindness or partial blindness. Fortunately, veterinarians are particularly skilled in dealing with cataracts, and surgery can be used to remove them if they’re bad enough. Unlike PRA, there are ways to treat cataracts, and they’re often successful. The Canna-Pet worked almost instantly to relax him and ease some of his pain. We are very thankful! He also seems more relaxed in the car now and actually falls asleep rather than pacing. We always bring them with us anytime we travel! Her life and ours has changed like night and day. Thank you for helping our girl, she is our world! Canna-Pet has worked wonders for his uncomfortable skin.